You’ve probably studied teenagers’ needs, their culture, and even their ever-changing lingo in preparation to be the most dynamic youth worker your church has ever seen. But when was the last time you studied their parents? Plenty has been written in recent years about the importance of engaging parents in youth ministry. But maybe the real challenge is to reconcile that idea with one of the most common youth ministry variables: the parents. A Youth Worker’s Field Guide to Parents is for youth workers who struggle to communicate with and relate to the moms and dads of the teenagers they want to reach the most. Whether you’re a veteran youth worker or just starting out, or a church leader who wants to embrace parents more effectively, this book provides tips for peacemaking, insights for better empathy, and the motivation you need to make these important relationships work. Danny Kwon has been leading the youth and family ministry at Yuong Sang Church near Philadelphia for the past 20 years. He’s also a speaker/trainer for The Youth Cartel and Fuller Youth Institute, and he completed his Ph.D. on the topic of innovation in the local church. Along with his love for sports, eating, and making people laugh, Danny loves his wife Monica, a family and marriage counselor and professor, and he is the parent/youth pastor of their three teenagers. Note: Bulk prices are applied in the shopping cart. Simply add the number of this item you’d like to order and the price will adjust automatically. Parenting well is the hardest job on the planet. Partnering with parents in youth ministry may be the second hardest job. Regardless of your level of ministry experience, Danny’s personal stories and practical ideas will help you love and serve not just teenagers, but entire families. Where was Danny Kwon when I was starting out in youth ministry? I noticed something when my kids became adolescents: As a younger youth worker, I tended to think I knew better than (most) parents. Then, when my oldest hit middle school, I knew much more than any youth worker, I knew my child. 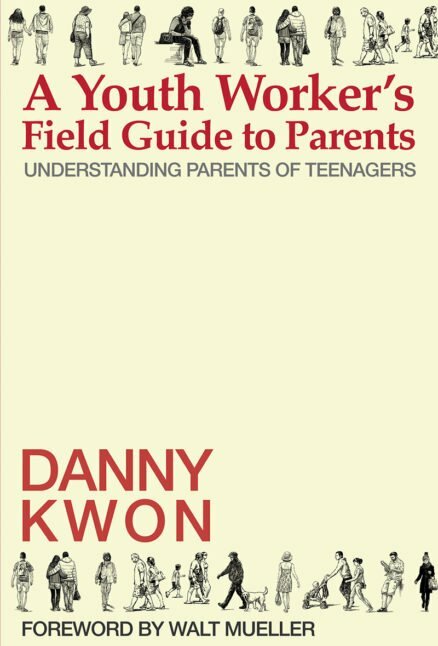 Danny Kwon is both a long-term veteran of great youth ministry and a careful, self-aware parent—and A Youth Worker’s Field Guide to Parents will help you to treat parents as partners, not as projects or obstacles. With insight and wisdom, this practical and accessible resource will help any youth worker build bridges with parents as the foundational relationship for a healthy, biblical youth ministry. When you reach the family, you reach the world. Danny Kwon has done an excellent job helping us learn how to partner with parents in youth ministry. His experience and expertise come across on every page. This book will motivate your team to understand that family ministry is not just a program but a mindset. This is an important book for youth workers. When I discern what books I’ll spend my limited time reading, I ask myself a couple of intrinsic questions: Do I trust the author’s authority? Is this something I need to understand more about now? Those answers are an enthusiastic yes for Danny Kwon’s inaugural book. Danny is a long-time friend and I’ve seen him work this out in his life and ministry. This is the perfect first book for him. He’s a war-tested expert and ferocious learner. His perspective is unique and critical. His advice mixed with humility is gold. I desperately wish this book was available when I started youth ministry. Danny Kwon is one of my favorite youth workers and he’s the perfect person to write A Youth Worker’s Field Guide to Parents. His introduction says it all, “I am a parent … and a youth worker.” So few make it to this point in youth ministry: being a parent of teenagers and still mixing it up in the trenches of the youth ministry world. This book honestly is a must read, and I absolutely loved it! It is full of wisdom, truth, and stories that will deeply resonate. In this book you will find a mentor and an empathetic friend. Buy it for yourself, your staff, and for all of your volunteers! Working with parents isn’t always easy. In writing this essential guide to working with parents, Danny has moved the “What’s the best approach to working with parents?” conversation light-years forward. I love Danny’s book. It’s smart. It’s insightful. It’s practical. The best aspect of this book is the real world connection that Danny makes to youth ministry. Danny is a practitioner—his ideas and advice are vetted in his church. This isn’t a book filled with ideas that might work in your ministry, it’s packed with effective strategies that will absolutely work. Read and digest this book. I’m convinced you won’t find a better resource than Danny’s A Youth Worker’s Field Guide to Parents. Just finished “A Youth Worker’s Field Guide to Parents” in less than 24 hours because I couldn’t put it down! I’ve personally not read anything like this that focused so specifically on dealing with youth group parents. It’s totally an invaluable resource that I wish I had access to 6 years when I started doing ministry at my local church. Chapter 1 set the tone for the book – youth parents are not the enemy (although we feel like it so many times!). Each chapter tackles a specific perspective on understanding and fostering greater love for the parents who we often misunderstand. I found this book so helpful because I myself am not married, let alone a parent. But the author really brings an interesting angle and crucial perspective as both a parent of teenagers and a youth pastor. Who else is better qualified to write a book than somebody in this unique role? I felt it was a balanced read in that sense – he expressed both the concerns/worries of parents as well as pastors. The strength of the book is in its practicality. It’s laced with anecdotes and wisdom principles and so carries the voice of a mentor in dialogue with you. You feel like he is teaching you through his own stories and personal experiences, drawing out really important principles for ministry that aren’t theoretical but drawn from actual encounters with parents. If you’re looking for something technical and theologically rigorous, you should look elsewhere. If you want to glean the wisdom of a pastor who has been at his church doing ministry for over two decades and resonates with both youth parent and youth pastor, this would be a great resource. Although I wished this book came out before when I started doing ministry, I’m glad it’s out now and look forward to reading more from this veteran youth pastor. Do yourself a favor and get this book in your hands NOW!